I was never so happy to see an overcast sky with heavy fog as I was when I woke up yesterday morning. 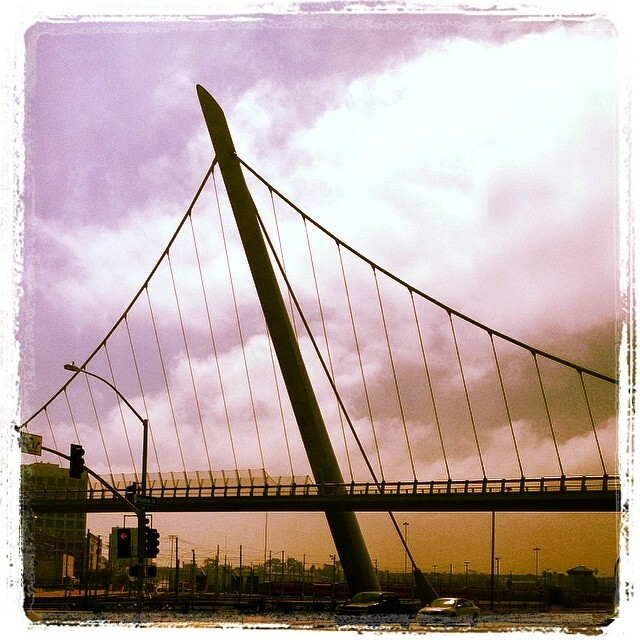 A heavy marine layer is the closest thing to rain we can generally hope for during the summer months in Southern California, and after humidities below 5% and temperatures soaring above 100 this past week, we’ll take any relief we can get. Unless you’ve been living under a rock, you have most likely heard about the wild fires that spread throughout San Diego’s North County starting this past Tuesday. 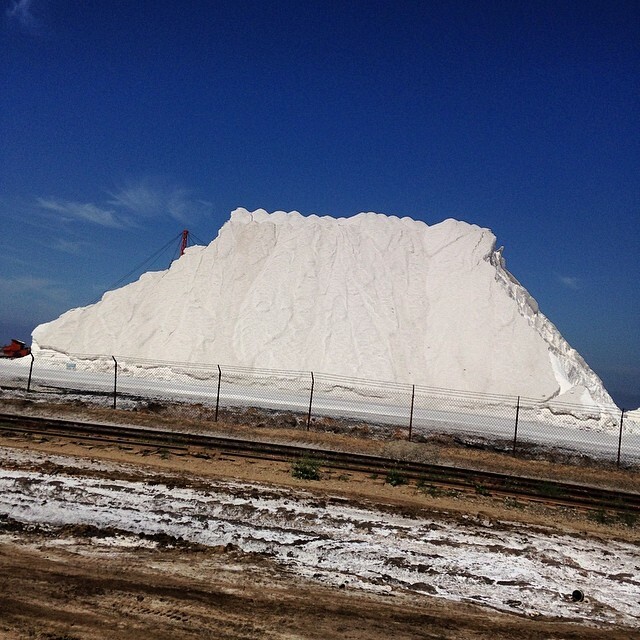 Many of our members live in North County, and several were forced to evacuate from their homes. Everyone was affected by the poor air quality and the stress of not knowing where fire would break out next, how it might move, and how quickly the brave firemen coming from all over the state could get each of the 11 fires under control. While there was valid concern over the air quality for riding yesterday, we were all anxious to have a little beauty and lightheartedness in our lives – and of course, the feeling of freedom and release that one can almost always find on her bicycle. Fortunately, the ride we had planned early last week was situated just far enough south to be well away from the worst of the devastation. Having reviewed the weather with fellow Team Fun members (especially those who grew up in Southern California), the advice I received was that while the forecast called for cooler temperatures for Saturday, after such a prolonged Santa Ana weather pattern, it was likely to still be quite hot Saturday. 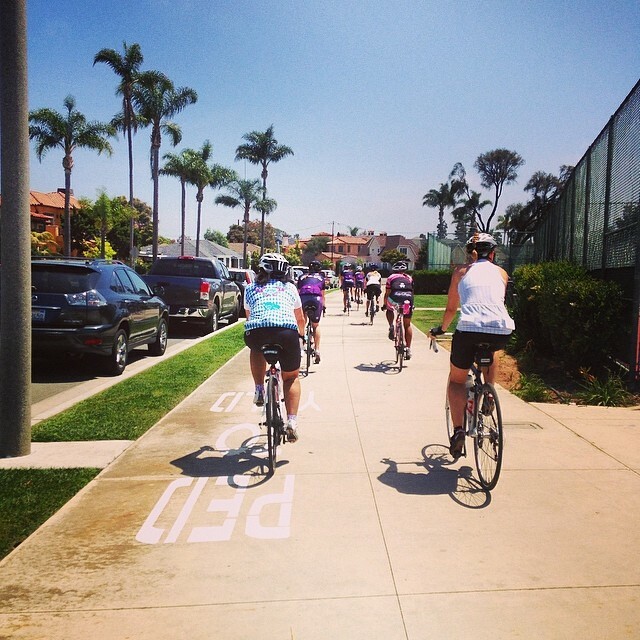 We should stick to the coast – so I bumped up our planned Coronado Adventure ride from the 24th to the 17th. 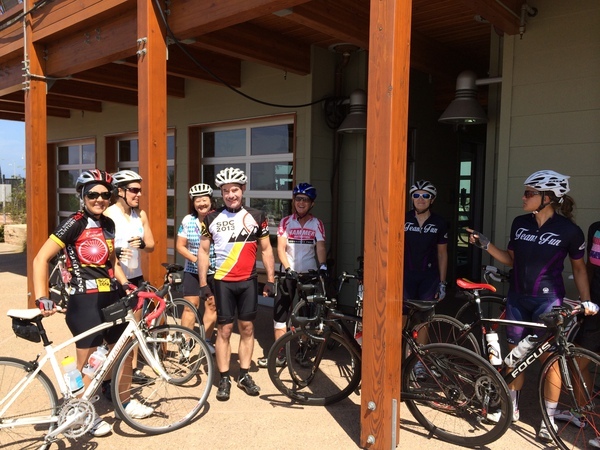 Despite the intensity of the week, we had a large turnout for the ride. 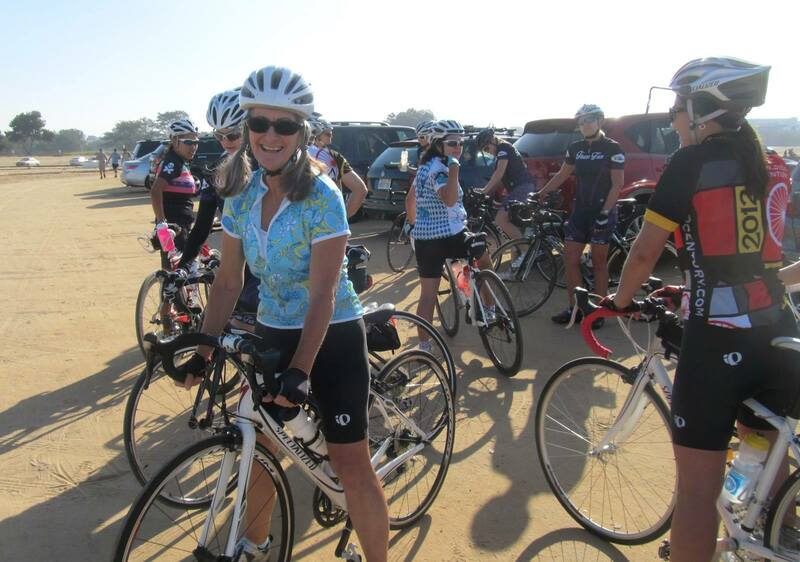 In total, we had 18 women + one husband show up at the Torrey Pines Gliderport in refreshing morning air. We organized into our three groups based on planned speed, which ended up being only two groups more based on distance – as the ride would be about taking in the surroundings and enjoying the company more than it would be about speed (a little bit of speed crept in, but more on that later). 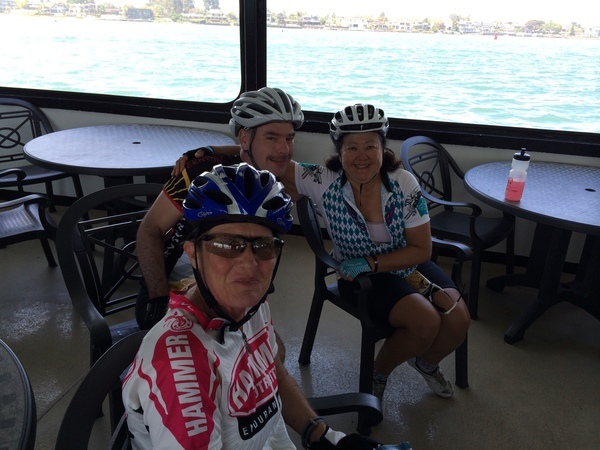 The “C” group was led by Kim Z. and Michell. I think Michell was a little disappointed today that we started so much closer to her home so she couldn’t manage to get an epic >100 mile ride in again, but she tried her best to get close to the 100 mark anyway. I’ll include her ride report below. The route enjoyed by the “A/B” group (which was laid out for me by Michell, who is an expert in the by-ways of the city) is perhaps one of my favorite routes I’ve ever done, and will probably remain one of my favorites. 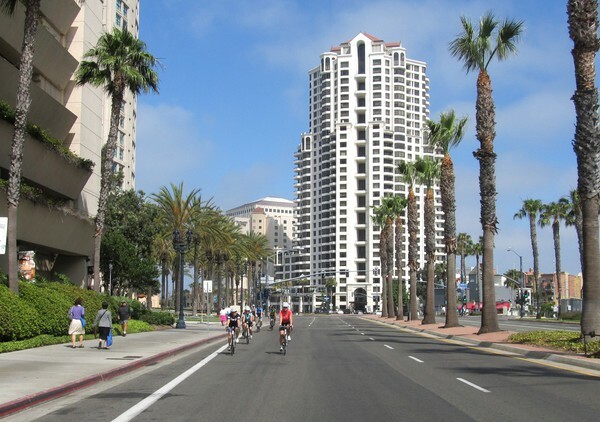 I would say that somebody should consider making this into a “Tour of San Diego” ride and an annual event, because routes don’t get much better. With a distance hovering near a metric century, very little climbing, and a route that takes a multitude of the city’s most popular sights, it is a memorable experience anyone would want to return to. 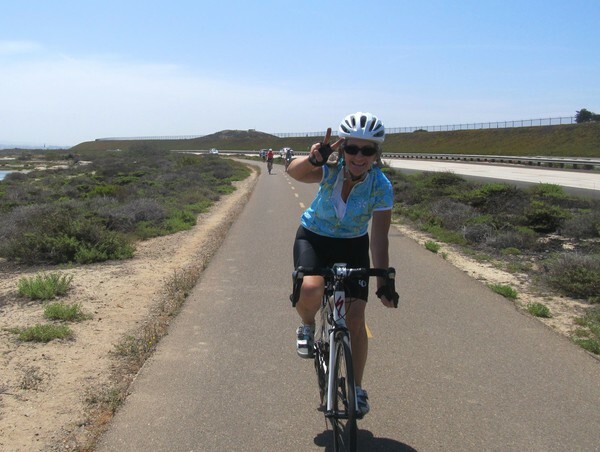 We began a group of ten at the top of Torrey Pines, and our tour first took us on the glorious descent of La Jolla Shores, winding around and past the seals and sea lions at La Jolla Cove. We usually stop for a quick photo opportunity, but that place can be a little pungent, and was particularly noxious yesterday. So we continued on through the mansions of Bird Rock, down through the hip vibe of Pacific Beach, and then entering Mission Bay Park at the north end. 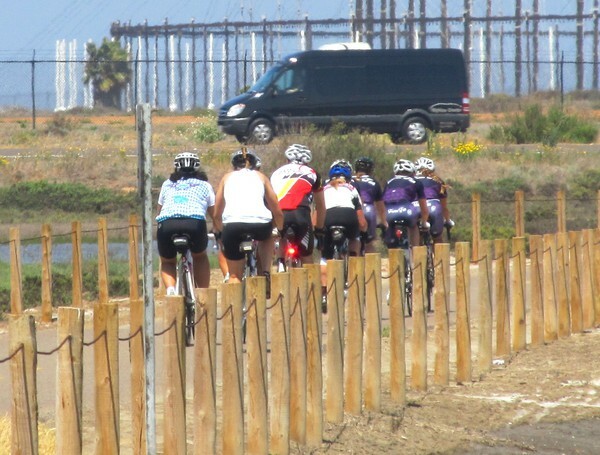 In spite of the somewhat stiff south/southwest wind, we loosened up our legs and were able to build up and maintain some speed through this open, flat stretch with few stops (from here one can see Sea World, another famous San Diego sight). From there, we worked our way over to Old Town, with a quick restroom stop at the train station before continuing on through to Kettner Boulevard, which we took straight through the business district of downtown. For many of the group, this was their first time riding within the city proper. 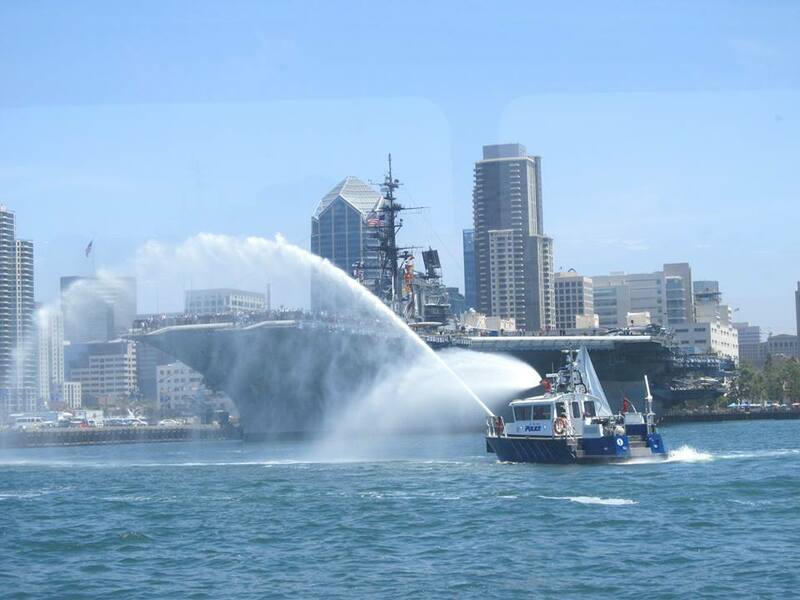 We exited the downtown onto Harbor Drive and passed by Petco Park, then headed south through the Port area, noting several huge ships – including a massive Red Cross ship. 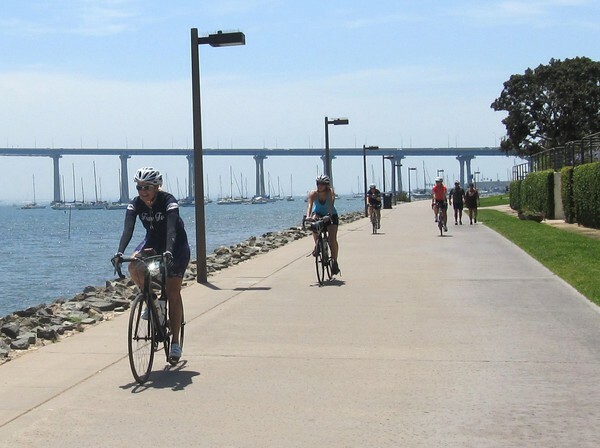 This part of the route is also known as the Bayshore Bikeway, and even if you do not have your directions written on handy little note cards, it is fairly easy to follow, as it is well-marked with bike route signs. There is a clean public restroom that is always a welcome respite located at the marina just prior to entering the bike path proper that leads to and around Imperial Beach. This was our second stop. 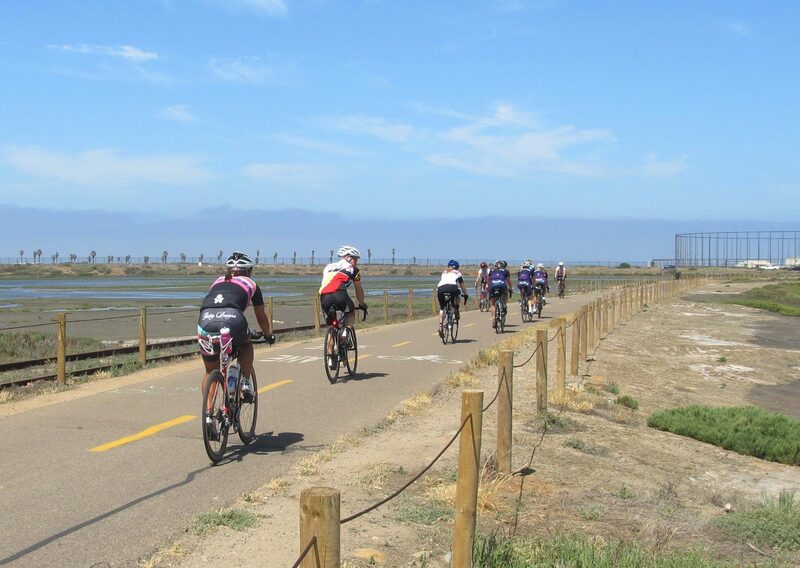 The bike trail is completely off road for much of the rest of the trip to the Coronado Island Ferry dock, passing by the salt flats near Imperial Beach, up the Silver Strand, and around the golf courses and resorts of Coronado Island. The trail can be a bit crowded on a Saturday no doubt, although I know I, for one, didn’t mind slowing a little bit when facing the forces of what was a pretty massive headwind leading across to the Silver Strand. We enjoyed the blessed tail wind, for once!, all the way up the Silver Strand. I was really feeling into the groove at that point, and we progressing along at a great clip in a nice, long, tight line when all of a sudden, a pre-teen riding a cruiser in the middle of the path decided to look down and swerve toward us. Amazingly, we all escaped calamity (just barely). It was to be the only blight on our ride. We re-grouped at the end of the Silver Strand, took stock of the time, and realized that we had about 15 minutes to make it to the Ferry landing, or we’d be stuck for another hour. 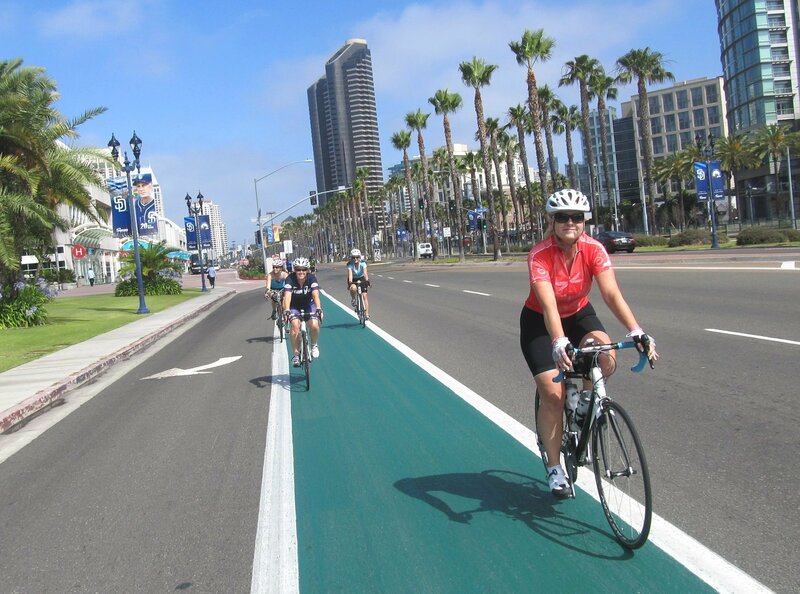 One could be “stuck” in many worse places than Coronado Island, where we could’ve enjoyed a wide variety of deliciousness such as cupcakes or ice cream, but keeping the ride not too long is sometimes part of what keeps it enjoyable. I knew that the last time I’d been to Coronado, my entire family + my dad shoved into a surrey had made it from the point we were currently standing to the Ferry landing in under 15 minutes, so I figured that we on our carbon fiber road bikes with a tailwind surely could succeed. And we did – hurriedly handing the nice men manning the ferry ticketing cash for four of us at a time, we wheeled onto the bottom level of the ferry for the short ride across the bay. A little break from the sun, a little break for the legs, a little root beer in the water bottle (Jill! ), and we were ready to finish out the fifteen or so miles back to the Gliderport. 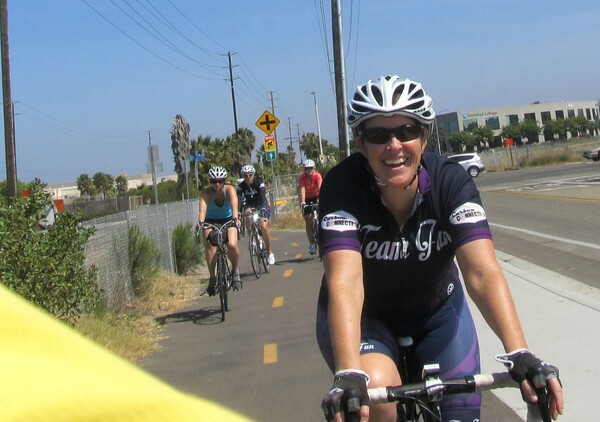 I opened up the pace a bit more here and there during that last fifteen miles – I get a little bit of “finishing fever” at the end of a ride, and anyway, I feel like I would’ve let the group down if we hadn’t kicked it up every now and then. For a few riders, this had been the longest or one of the longest rides of the year for them – for some, maybe the longest ride they’d ever done. It was the best way I know I could’ve imagined closing out a really trying week. I can’t wait to do this one again! 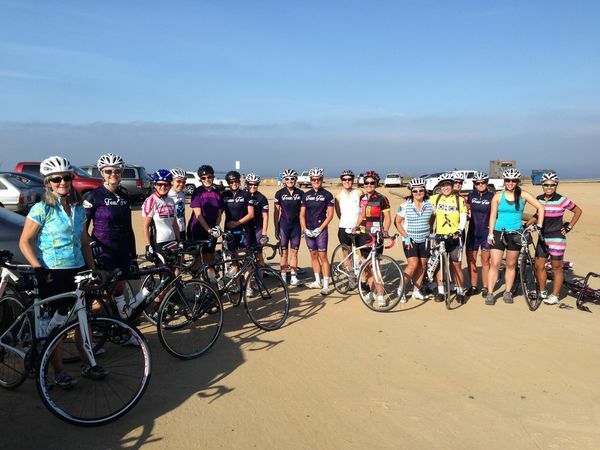 We had a rather large turn out for the month’s adventure ride from the Gliderport to Coronado Island and back! 18 brave souls turned up, and I was very happy to be allowed to tag along with Kim‘s C group doing the shorter (more direct) route. 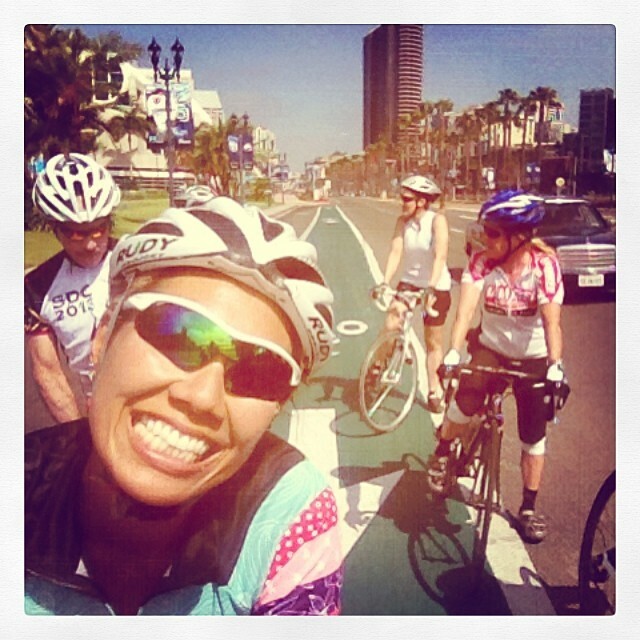 We thought there would be 8 of us, but two took off with the faster A & B groups heading for a loop around the La Jolla Shores instead. 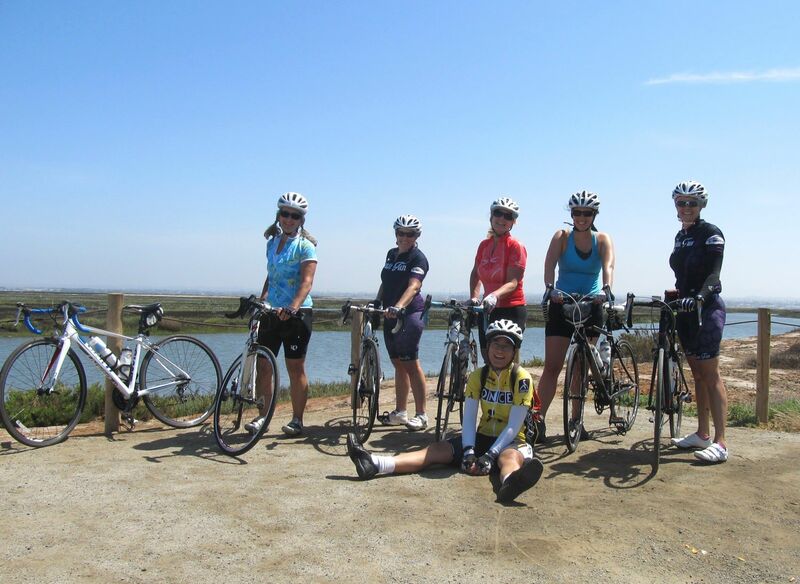 Our sixsome turned through the UCSD campus instead of into La Jolla Shores, and had a nice descent down Gilman Dr and through Rose Canyon & Rose Creek bike paths (the latter needs some sweeping again, btw. It’s looking pretty well shedded through there!). We stuck together really well all the way through Downtown even though we were going at a pretty brisk pace, and even chatted up some new cycling friends when another peloton joined us in Bario Logan. 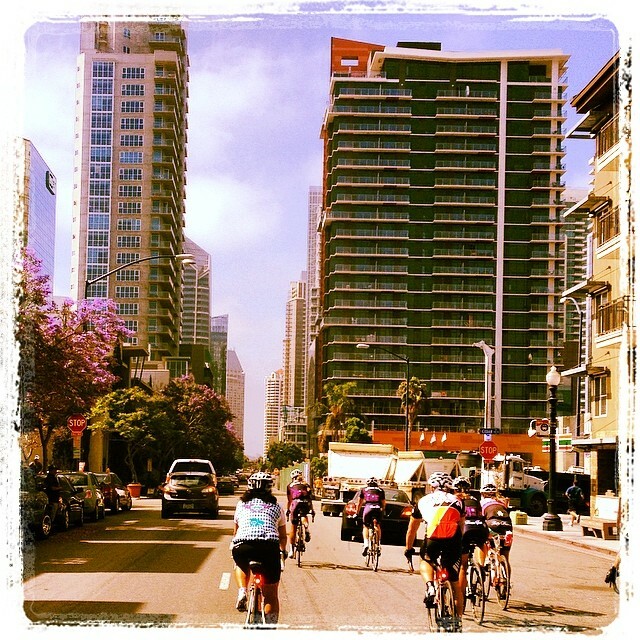 Bayshore Bikeway was experiencing heavy (and happy) cycling traffic! We passed a big bunch of happy Turtles (Ride with Javi) at the South Bay salt marsh area, and were stopped for a scenic photo op at a rest area just past Imperial Beach when ‘Whhhooooosh!’ came the combine A & B groups tearing up the pavement at great speed (and they were even smiling while they were at it!!!). I was almost tempted to give chase, but Dee’s rear tire had a better idea and decided to spontaneously deflate, giving us a really good excuse to stay put for a while before resuming at a more humane pace. 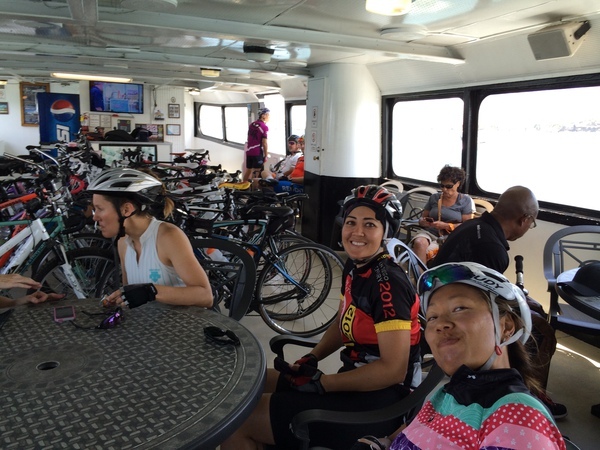 Oh, the Coronado ferry is making a killing off cyclists, too! There must be enough parking on their boat for at least 30 bikes, but the racks were filled to capacity in no time at all. 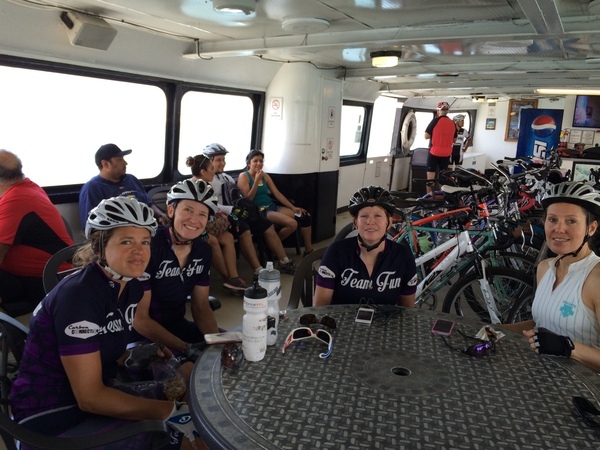 It won’t be long now before they add a couple more ferry boats to their fleet, ones that are pedal powered!